A NEUTRAL outlook. 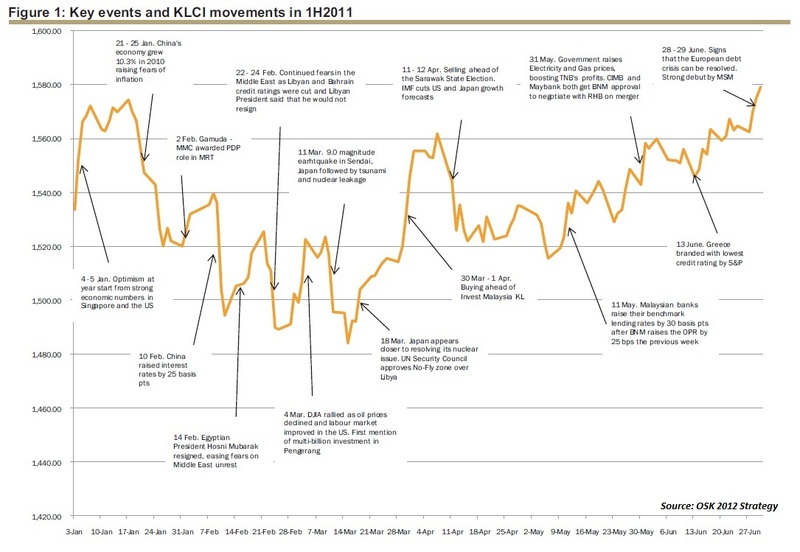 We have a Neutral outlook on the Malaysian market going into 2012 as the combination of uncertain growth outlook in the US and Asia coupled with a possible recession in Europe cloud the prospects for strong earnings growth locally. While we see Malaysia likely to avoid slipping into a recession, the deficit reduction exercises undertaken by Eurozone economies may well tip their slow growing economies into a recession. In any case, for Malaysia, we see earnings growth slipping to between mid single digits and low double digits, a pale shadow of what it was in 2006, 2007 and 2010 when earnings growth came in between 20 to 30%. Newsflow on developments surrounding the handling of sovereign debt in Europe and the US will also likely lead to volatile markets worldwide. As such, in the short term, we are faced with volatile markets which will likely give way to a dampened economic outlook. 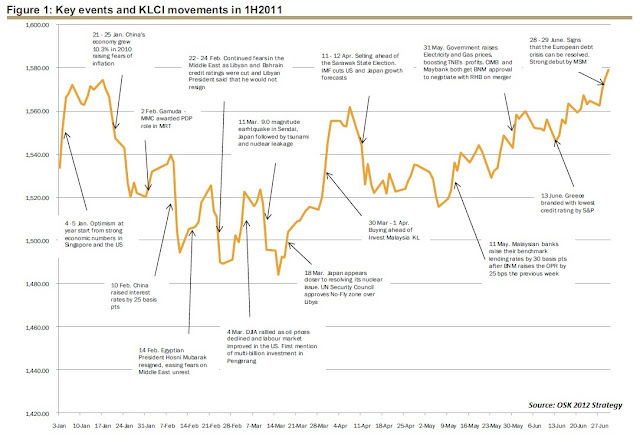 We advise investors stay cautious into mid 2012 and focus on Defensive sectors such as Consumer, Telco, Healthcare and Media. 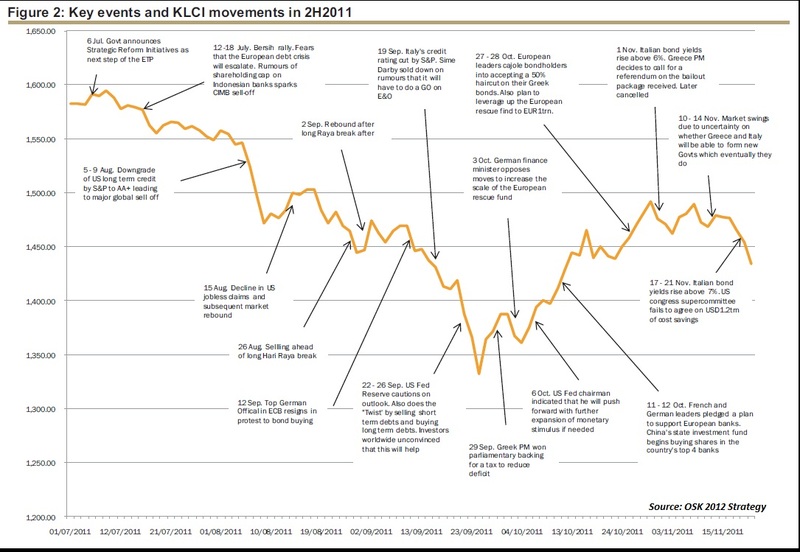 Our 2012 KLCI fair value is 1466 pts based on a PER of 13.5x or 1 standard deviation below the historical average of 16.6x given the uncertain market conditions. 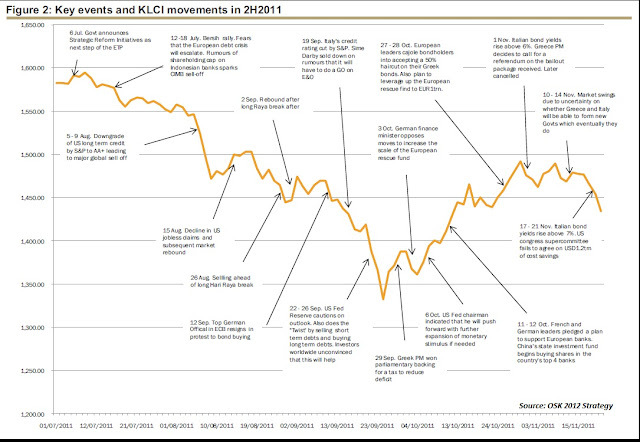 Buy when the KLCI falls towards the 1300 pts level as the broader market then offers a 10% upside to our 2012 fair value. As we do not see Malaysia entering into a recession, we do not see an earnings contraction and value should emerge closer to 1300 pts. A combination of still positive earnings growth, low foreign shareholding and the Economic Transformation Programme should mean Banks (leading the economy), O&G and Construction (beneficiaries of the ETP) will present good entry points at that level of the market. Sell when the KLCI rises towards the 1500 pts level as the market will be overpriced then. We still see fundamentals remaining weak. Although the 3Q2011 earnings season may have seen a slight improvement q-o-q, most of the improvement was focused on the Small caps where analysts have had time to pare down forecasts. On the flipside, Big caps continued to slide with the potential for more downgrades in the coming 2 quarters. 7 sectors to focus on. Given our generally defensive outlook, investors are advised to focus on the Consumer, Telco, Healthcare and Media sectors as mentioned above. At the same time, when trading opportunities present themselves, Banks, O&G and Construction should come into play. To note that we are only Overweight on 7 sectors, Neutral on 9 and Underweight on 2 sectors. Top Buys reflect this overall strategy. In terms of our Top Buys, they reflect this overall strategy. 6 of our Top Buys, namely Axiata, PetGas, Telekom Malaysia, QL Resources, KPJ Healthcare and Media Chinese reflect our Defensive Strategy while 2 others are from our Alternative Defensive Buys namely AirAsia and TRC Synergy. While coming from the cyclical sectors of Transport and Construction, we believe these 2 companies can leverage upon falling fuel prices and MRT contract certainty to warrant defensive investment in 2012. Finally, we choose Maybank and Dialog as our Top Trading Buys to round off our Top 10 for 2012.